UPDATE: Now 80% off. Read my review here. 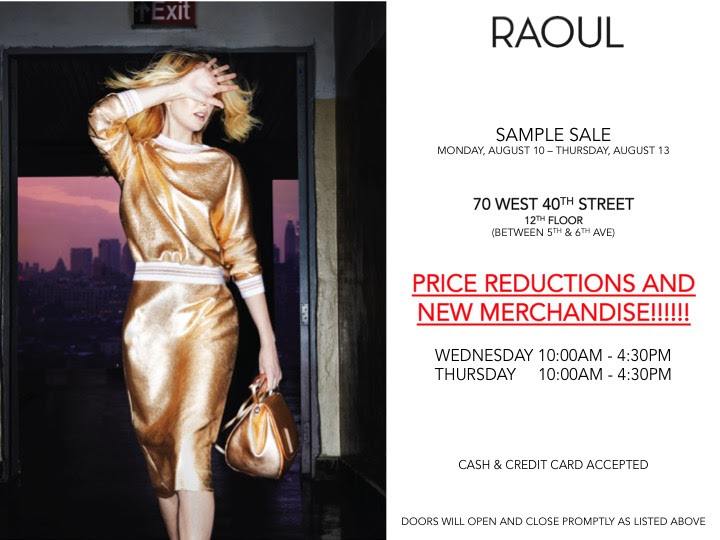 The sample sale season continues at 260 Sample Sale’s SoHo location. Get ready to shop ready to wear, couture gowns, and sportswear from Badgley Mischka at up to 75% off retail. 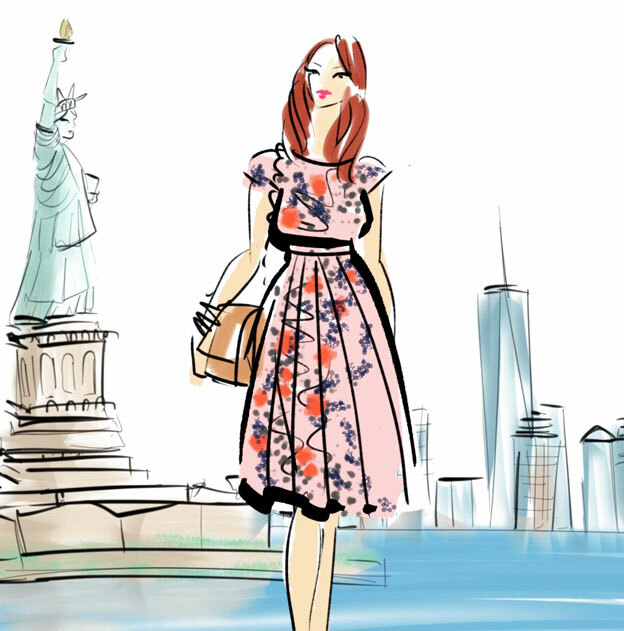 The American design duo are well known for their impeccably stylish and glamorous gowns, worn by the Hollywood elite. 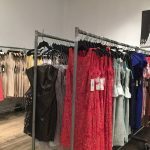 The last public Badgley Mischka sample sale was several years ago and offered amazing deals on true samples and ready to wear. Peach and Lily will be hosting a first ever K-Beauty event featuring amazing deals on make-up and skincare with discounts of up to 80% off retail. Everything will be just $5 or 5 items for $20! You can expect to find popular Korean brands like Peripera, Mizon, Clio, and much more straight from Seoul. Champagne and light refreshments will also be available, while Snowdays NYC will be serving their signature shaved cream frozen desserts. Also on Wednesday from 7pm – 8pm join a special powder room talk with the brand founder, Alicia Yoon. Calling all brides and bridesmaids! There is yet another sample sale to add to your wedding shopping list. 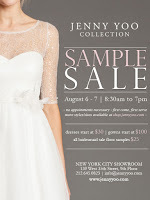 With discounts of up to 85% off and sample bridesmaid dresses starting at just $25 the Jenny Yoo sample sale promises to be a bargainista’s paradise. There will also be $30 dresses and gowns will start at only $100. Better get there early for the best selection. 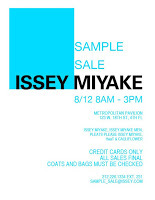 Issey Miyake‘s annual one day sample sale returns this month. Featuring both womenswear and menswear from the designer’s eponymous label as well as Cauliflower, Pleats Please, and HaaT. At last year’s sale discounts were around 75% with prices averaging around $100 – $300. From the perfect pleat to technology-driven sculptural designs, Issey Miyake creations are a form of wearable art and die hard fans will not want to miss this sale. A late addition to the August calendar, Raoul, the Singapore-based fashion and leather goods label from a husband and wife duo offers luxury at affordable prices. Starting at just $15 for true samples the sale has a wide selection of seasonal apparel at up to 90% off suggested retail. Leanne Marshall, of The Project Runway fame (she won season 5!) 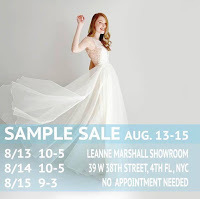 is holding a three day sample sale in her NYC showroom that promises deep discounts on bridal and ready to wear. In 2011 Leanne launched her signature bridal line, known for light, flowing lines and timeless elegance. Her dresses are handcrafted in the USA using highest quality materials. 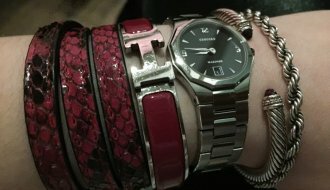 A sample sale for nail polish? Count me in! 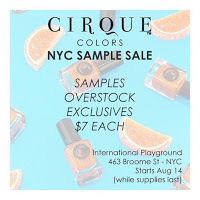 Cirque Colors, a Brooklyn based beauty brand specializing in hand blended nail lacquers, founded by Annie Pham, is holding its annual sample sale at The International Playground in SoHo. 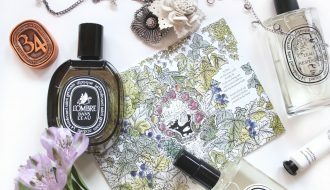 All products are hand mixed in small batches and individually hand poured, they also do not contain toluene, formaldehyde and dibutyl phthalate. 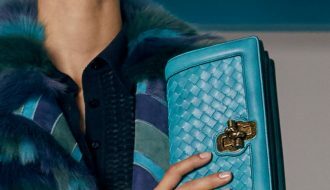 The sale will offer samples and overstock, including unreleased products like prototypes, one-offs, and samples from the fall collection for $7 each. 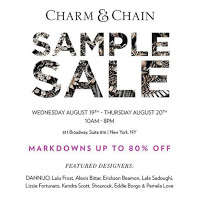 The popular e-commerce retailer, Charm & Chain, is set to host an offline sample sale featuring brands like Dannijo, Alexis Bittar, Lele Sadoughi, and more. Expect to find trendy and fashionable costume jewelry at up to 80% off retail. 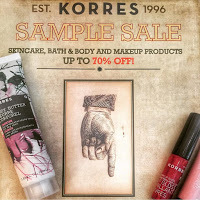 Greek cosmetics brand, Korres will be holding a very rare two day sample sale in NYC. Expect to find skincare, beauty, bath and body products at up to 70% off retail. 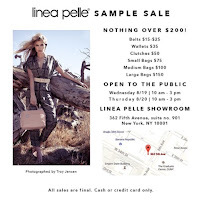 Linea Pelle will be hosting a two day sample sale inside their midtown showroom where nothing will be over $200. Starting at just $15 for belts, $35 for wallets, $50 clutches, $75 small bags and $150 large bags. 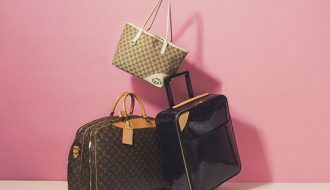 Don’t miss you chance to stock up on trendy handbags crafted from fine Italian leather (though they’re not made in Italy). 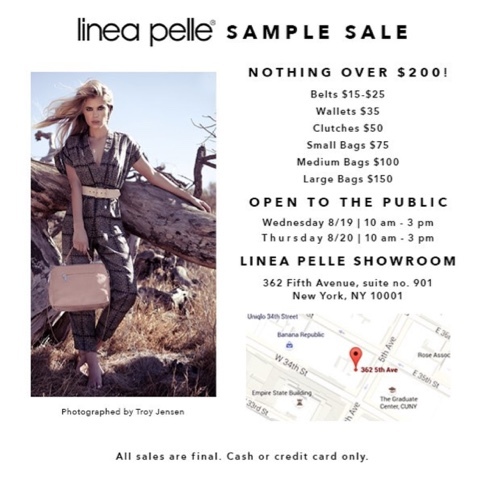 Another Project Runway winner is holding a sample sale this month! 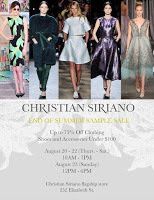 Christian Siriano will be hosting an end of summer sale inside his flagship store in Nolita. Expect discounts of up to 75% off clothing with runway shoes and accessories under $100. After winning season four of the popular reality competition, Siriano launched his eponymous label in 2008. At the last sale discounts were close to 90% off on select items and included additional markdowns during the last few days. UPDATE: Extra markdowns of up to 50% off (8/27). 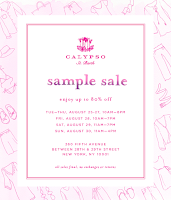 The luxury lifestyle brand, Calypso St. Barth returns for their end of summer sample sale with discounts of up to 80% off. Stock up on resort ready looks for that Labor Day getaway. Aside from apparel, last Spring’s sale also featured furniture with prices from $19 – $99, comparable to the in-store seasonal sales. My advice it to wait until the last few days when prices get slashed even further.